Ah, chips. Who doesn't love them? If only—and I'm being nitpicky here—if only they could, I don't know, turn your tongue some ungodly color for no reason. Right? Oh, wait, PepsiCo's Twisties to the rescue! 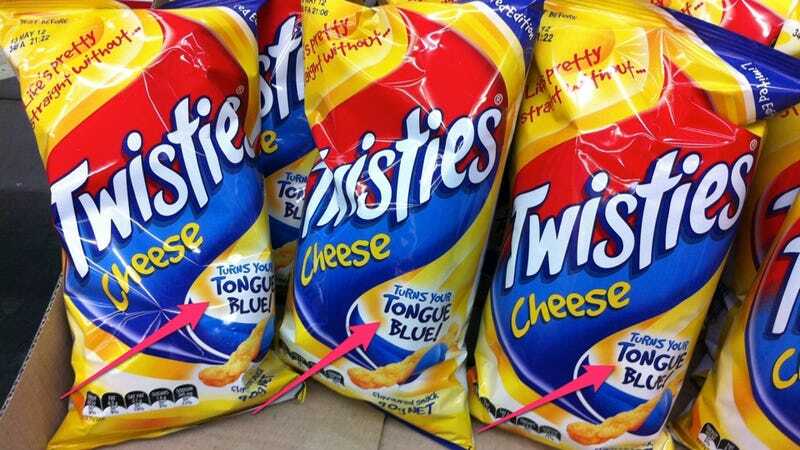 Yes, PepsiCo Australia's popular Twisties brand of chips (or "crisps," as they're sometimes called by people who talk funny) is releasing a limited edition called Twisties Blue Tongue. According to Jenni Dill, Twistie's marketing director: "Twisties Blue Tongue involves consumers in a real snacking experience and re-energizes consumer's love for the Twisties brand."